After years of intensive work, the Czech government’s negotiator with the European Union is finally seeing success. The European Commission has suggested that the Czech Republic becomes an EU member on 1.1. 2004, along with nine other countries. According to the STEM public opinion poll, the new premier is highly popular. Around 75% of the respondents have firm confidence in him, a figure similar to the positive results Josef Tošovský’s provisional government received in 1998. The chief of the People in Need Foundation can be happy. The charity concert of Czech stars, which was co-organized by the foundation, made almost CZK 7 million in proceeds. The money will be donated to people suffering from the August floods. The police president deputy resigned from his post after he caused a car accident under the influence of alcohol. It is notable, however, that he faced the incident without excuses and took immediate responsibility by resigning. The court case concerning the board chairman of the bankrupt construction company H-System, which deprived clients of more than a billion crowns, has finally begun. If Smetka is found guilty, he will go to prison for up to 12 years. An influential ČSSD member, Kučera was chosen by the Council for Radio and Television Broadcast as chief of this institution’s council office. Minister of culture Pavel Dostál protested sharply, on the basis that Kučera was censoring musical lyrics in the 1980s. AFTER EIGHT MOVES and five jobs, Viktor Šebík (35), a native of Prague and graduate of the College of Chemical Technology, finally achieved his professional goal. In April of this year he was named operational director of one of the most prestigious Czech firms, Karlovarská Becherovka, thus becoming one of the fewer than ten people who know Jan Becher’s secret 200-year-old recipe for making the so-called 13th Spring of Karlovy Vary. Before he joined Becherovka he worked for various firms – from dairies and a plant for the production of artificial salami liners to Velvana, which makes chemical products for the automotive industry. Šebík proved his ability to modernize production there, bringing Velvana excellent results and himself the attention of a headhunting firm, which recruited him for Becherovka to work similar magic there. “You can’t reject an offer like that,” says Šebík. “Wherever you look you’ll see Becherovka – in ultramodern bars, in the wine pub at the Castle, at a stand under a bridge,” he says, adding that the digestive is popular not only with Miloš Zeman, but also with actors Gina Lollobrigida and Alan Alda. Together with a technician, Šebík supervises production, which, in his words, is surprisingly simple. “It calls for about 20 herbs, some of which people commonly pull out of their gardens as nasty weeds,” he explains. Even though he had to give up playing in the Prague bluegrass band Veget for his new job, he thinks he’ll stay in Karlovy Vary until he retires. 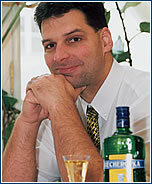 “Becherovka is my lifelong calling, I live for the firm, and I hope to be there for a long time.”. DURING HIS ELEVEN years in business, Vratislav Randa (40) has traversed a remarkable path marked by indisputable success. 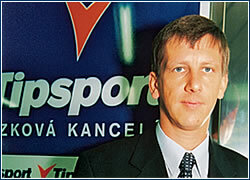 The director, board chairman, and co-owner of the largest Czech betting agency, Tipsport, began running the firm in 1991 from a rented storage room in the basement of an apartment building in his native Beroun. His day job was as an economist at an agricultural cooperative, yet he found time to run Tipsport after work. The firm, which was number two on the market after Horáček’s Fortuna, was seen as an underdog with no chance of survival. Another strike against Randa was the fact that he is not by nature a gambler. But he couldn’t resist the challenge to create, virtually by himself, a competitive product, and he wanted to see if he had what it takes. “I always wanted to be the best. I wanted a perfect grade average in college, and my desire to stand out never left me when I went into business,” he confides. At the beginning his goal was to set up at least ten branches. “But some of my friends thought I was being overly optimistic,” Randa recalls. He can now smile about their skepticism of that time, because his company now has over 650 branches. Each year he opens over 100 outlets, and in 1999 he bested his competitor, Fortuna, with over 45% of the market. He is aware that by 2004, when the Czech Republic should join the European Union, he must build a strong, stable firm that can stand up to foreign competition. Absolute concentration on growth has paid off for him. Last year Tipsport’s sales came to CZK 4.1 billion, and this year’s sales are estimated at CZK 4.5 billion. And how would this successful entrepreneur characterize himself? “I don’t like ostentatiousness, I don’t have a 400,000 crown watch, but I’m fanatic about my job,” he concludes with satisfaction.